If you have decided that Twitter is the social media platform your business is focused on using, then it is time to understand how to use the hashtag, as this is one of the most important and powerful tools you will have at your fingertips. Hashtags have also taken over several other social platforms including Tumblr, Facebook, Instagram, and Google+, so even though the hashtag originated on Twitter, it is a powerful tool on almost all social media platforms. In this article we will focus on the Twitter hashtag, but the same principles apply on any other social media platforms. So don't worry, once you master the Twitter hashtag, you can use the same ideas across all platforms. And of course, the hashtags you create specifically for your business should remain consistent across all the social media platform you use. But a hashtag is much more than the symbol. It is a powerful tool, because by adding that simple symbol in front of a word or phrase, you are instantly creating hypertext that links back to all instances of that same hashtag on Twitter. Hashtags are ways to organize tweets or posts into categories of information. For example, this specific tweet from our Twitter page classifies itself as being about #socialmedia. Including this hashtag allows Twitter users to easily search through anything that is tagged with #SocialMedia. This is a more general hashtag, so yes, some of the tweets will probably not have quality information, but there will also be useful information about social media that is easily accessible by merely clicking on #socialmedia. When you click on any hashtag, note that there will be a "Top" selection and an "All" selection as seen below. "Top" will yield results based on popularity and will usually be a bit less spammy, whereas "All" will yield results in real time. It will show you a stream of people who have posted using the hashtag, with the most recent one at the very top. Think of the hashtag as a link to a wealth of information, just like a Google search or some other way information is classified based on keywords. In fact, you can click on the tweet in this blog post and it will take you to Twitter and the #socialmedia search results. You may be a little confused here if you've used Twitter in the past to actually search words or terms. Twitter does indeed allow you to search "social media" without the hashtag, which pulls up lots of results that include #socialmedia as well as mentions of "social media". So what is the benefit of using #socialmedia vs using just social media? With the hashtag users are much more likely to click the hashtag and view more. So if your tweet is hashtaged it is a much simpler process to find it than if it just contains keywords. And while searching actual terms may be useful in some instances, hashtags are much more user friendly and can result in higher interactions with your tweet. You create a hashtag very deliberately. You want it to be something that can stand alone as a hashtag and still make sense. Keep it simple: you want people to be able to remember it! Keep it short: your 140 characters are precious, don't use half of them on one hashtag! Keep it original: Search the hashtag before you start promoting one to ensure that there isn't already tweets being categorized under that label. Keep in mind your really not in control: users just may not adopt your hashtag. Twitter users have a mind of their own, so don't expect every hashtag to be a success. Thinks of all possible meanings: a seemingly innocent hashtag can end up being a totaly fail (and we don't want another #susanalbumparty incident). If your looking to get more eyes on your posts, and hopefully gain more followers, using a hashtag that is commonly used like #socialmedia or #marketing may be a good way to begin experimenting, especially if you have Twitter Analytics set up and can see what kind of impressions and engagements your tweets are receiving. We tested out some different hashtags on similar topics and found some some interesting results. When we used the hashtag #contentmarketing we saw fairly normal impression rates, when we used #blogging we saw extremely high impression rates as seen below. This is important, because the keywords you choose to hashtag are extremely important to visibility. Testings out the effectiveness of different hashtags, or even combining hashtags can allow for greater visibility and better overal results. Just remember creating unique hashtags just for your business should eventually be a part of your plan. Let's say your hosting an event and want to gain some Twitter love. Create a unique hashtag and ask event attenders to tweet as they see fit using a simple, easy to use hashtag. Let's say BizTraffic hosted a conference, we could call it #BizTConference14 or #BizTConf14, or really anything that creates a way to categorize tweets and isn't super long. Or let's say you have a new product or book coming out. You can hashtag the product or book title. Let's say we wanted to have a chat with our followers and let them ask anything they wanted about online marketing. We could promote the chat session, and create a hashtag (something like #BizTChat). Then, followers could treat questions or comments using the hashtag, and whoever was designated to be answering those questions could click on the hashtag to see all results and respond to those questions. I often respond to their hashtags, and it sparks some great conversations. They've done multiple book related hashtags that make the tweets personal. This is successful hashtag marketing. Find ways to make your product or service one that is personal, and ask your followers why in a specific way. This will create a much greater response than a generic #socialmedia hashtag. 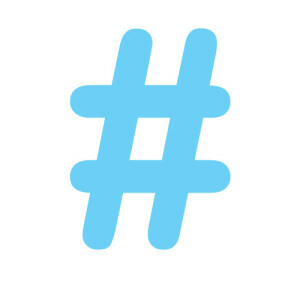 Hashtag marketing is an important part of using social media platforms. Users were using hashtags long before Twitter or any other platform implemented the hypertext aspect of hashtags. This goes to show the importance of the hashtag for users: the created it and adopted it long before social media platforms did, therefore they find it an important feature when it comes to interacting on social media. Use this to your marketing advantage by creating clever and fun hashtags that will encourage engagement with your brand. Social media should be fun and unique, so use hashtag marketing as such.